I've waited to post something about my game for awhile now it mostly had to do with one of my goals being not to ask people for help until I had a lot of the work done. I know many of these projects get started and with good intentions but some get put on hold or lose interest, sometimes even restarted. This is a hobby a passion that we all share. I've had moments with this hack were I stopped working on it, one time for a good 6 months. I've also had to restructure palaces over and over again until I was happy with them. The game has gone through many changes. Its hard to see those hours now. I spent over 80 hours in palace 4 but the version you will see in my game only might account for 20 of those hours. hopefully you will feel it in other ways such as the game being more tighter or more well conceived. So as you may of guessed by the above statement my hack is nearing completion but there are still some huge things needed to be done. Maps, overworlds, caves, palaces, forced encounters, bridges etc are near completion towns dialogue and story as well. of course I still need to do some fine tuning to those things and I have some play testers already lined up. Before I get to far ahead of myself let me tell you a bit about the game and its intentions. I decided to make a hack that is close to the original in terms of design, story and leveling. I would classify it as being slightly harder then the original. If you've only ever beat Zelda 2 once this might me a bit of an uphill battle but I feel it's still beatable. I've really tried to make it so as many people can play it but still tried to keep it Nintendo hard. As the title suggests the game takes place in Winter....Winter Solstice to be exact. I really wanted it to have a specific setting. Ultimately I hope people will enjoy my game but my main goal in this regard was to make sure I would enjoy it myself. I have three big challenges right now music, sprites and hacking. 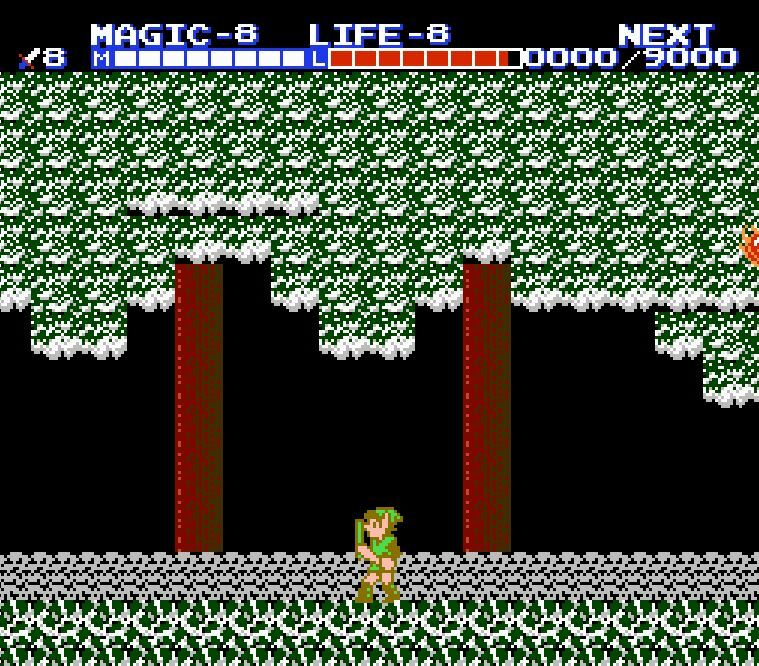 I've struggled with the idea of just considering changing the music because Zelda 2 music is so darn good, but when I think about Shadow of Night hearing that changed overworld music makes me want to at least attempt changing a few tracks. I've done most of the sprite work up to this point but its getting a bit too much and my skill set is definitely making it all take that much longer. it probably doesn't help that i'm really picky too. 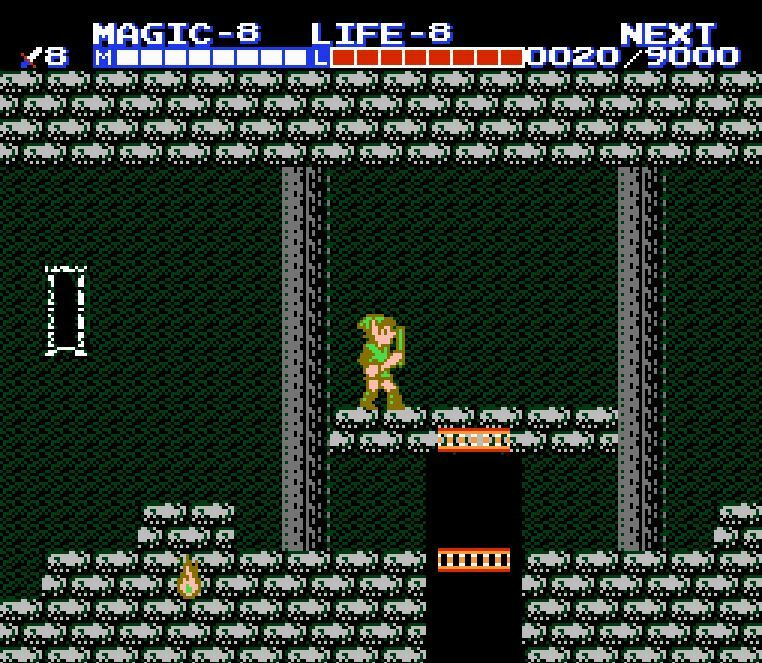 For the hacking part i've actually been very fortunate that a friend that just happened to be the maker of one of the two Zelda 2 editors I've been using has helped me tremendously. I can't overstate that enough. You can find his editor here https://github.com/cfrantz/z2doc/releases and the other editor I used which got me started on this crazy journey you can find here at romhacking dot net https://www.romhacking.net/utilities/1300. If anyone would like to help me work on some specific sprites or has knowledge of how to add / change music for Zelda 2 please PM me or message me here. I will of course give you credit for work and help with the game. I was kinda hoping we'd get to see some screenshots of what you have going so far, and also maybe some bullet points regarding what you are doing/plan to do that will set this hack apart from other Zelda 2 hacks (besides "slightly harder than the original" and "takes place in winter"). This seems to be a request for help, but I'm not quite clear on what you want help with (except information about how to hack the music, I guess). For the record, I'm not the person you want helping you. NES is not my bag, baby. But anybody who might be the person to help you will probably want to know these things, too. - every map has been fully changed. - almost every piece of dialogue is different with a whole new story. - starting the game with 3 hearts one magic container means more things to collect. - changing how much xp is given by enemies and made some minor changes to the leveling system. - the last big thing I plan to add is one new map making a total of 5 maps. which would then have 2 new palaces making it a total of 8 palaces plus Great Palace. I have this all laid out but have yet to create it. I don't know how this will effect the pace of the game right now and how much the extra levels from the crystals will make the game easier as this would add an additional two free levels. 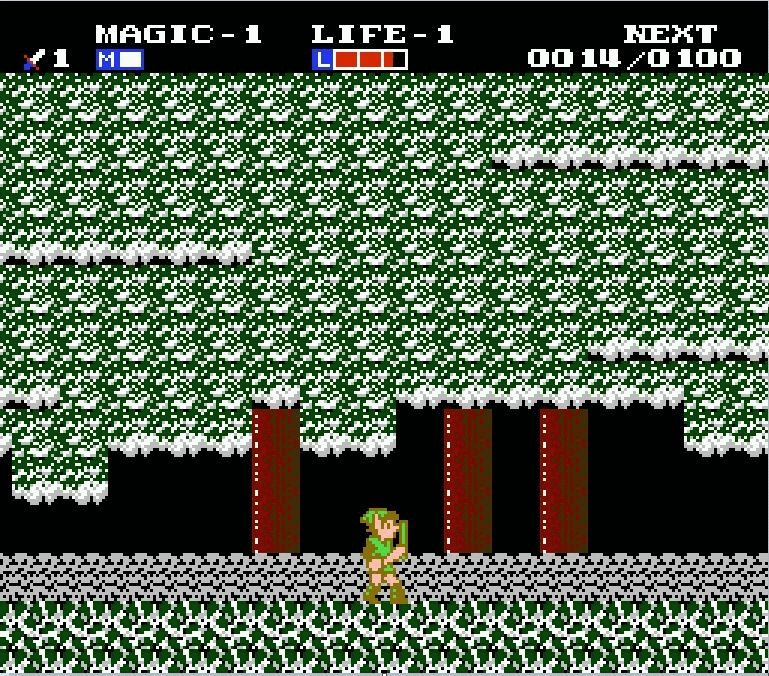 Alot of zelda 2 hacks in the past have either been reskins such as playing as error etc and some minor changes. Other zelda 2 hacks have tried to be hard type hacks some done more successfully then others. my aim is to build something like the original game but all new. neither be a reskin or something you potentially have to save state to beat or at least consider save stating to beat. Overall, just from the few screenshots you've shown, it's easy to tell you put a lot of effort into it. Pixel art is tough, and making stuff look somewhat decent can be a challenge! I especially like the screenshots with the spiral peninsula, and the layer of snow on the dungeon entrance. Also, that cape is quite interesting, ha ha. It is a unique design for Link, one that I haven't seen anywhere else. Fits well with the winter theme. Gotta keep warm, right? You should show the screenshots using the insert image button. Looks pretty good man! I'd take a look at ShadowOne333's hack project for a few ideas on improving your own. Between Rev Edition and Redux, its pretty much become tradition to make health into hearts at this point but there is a whole bunch of fixes for minor issues throughout the game that might interest you and i'm sure many hackers would be happy to help out or allow you to use them. I look forward to the release, it looks really great! I definitely like what you have so far Itemdrop. I also agree with Icepenguin and Shade Aurion as well. That tool you shared with me has been a big help in my newest project as well. I'm just not quite ready yet to show any pictures. LOL! As you know, I'm heavily looking into changing the music, and it is proving to be difficult.This has been beyond my abilities, but I'm learning some things as I'm progressing. I look forward to seeing how your hack progress. I do like the layering effect in the mock up you did ice penguin thanks for the advice and thanks everyone for posting your thoughts and input so far. Turning the health bar into hearts I had some issue with trying to do this 2 years ago and canned it. I thought it would be super simple. I've seen some screen shots and it does look really good. my only issue is what do you do for magic do you have jars because I feel leaving it as bars doesn't fit. I am tempted though to do it. As for changing links sprite I'm a bit of a sucker for the the classic design. Changing the tunic color I feel would definitely be justified and more fitting maybe darker green or a blue. I have played around with a lot of colors but haven't pin pointed one specifically. If you're keeping it close to the original design, does that mean no cape? Or are you talking about the palette? I think you should use the cape, it turned out good! Over time, you may even find ways to improve on it. As for hearts, did you want something like traditional Zelda hearts? The magic bar could still work as a meter, but having it function like hearts is possible. Your idea about the magic meter is very interesting idea, ha ha. I never imagined it being represented as magic jars since it's always been a sliding meter throughout the series. Also, about the leaves, I realize the number of objects in a level is limited, so keeping the treeline higher will allow you to get more creative with the layers. Okay I'll add the cape you've convinced me XD I'll try to make some slight improvements. Adding a cape to the overworld link might prove to be difficult though that sprite is so small. 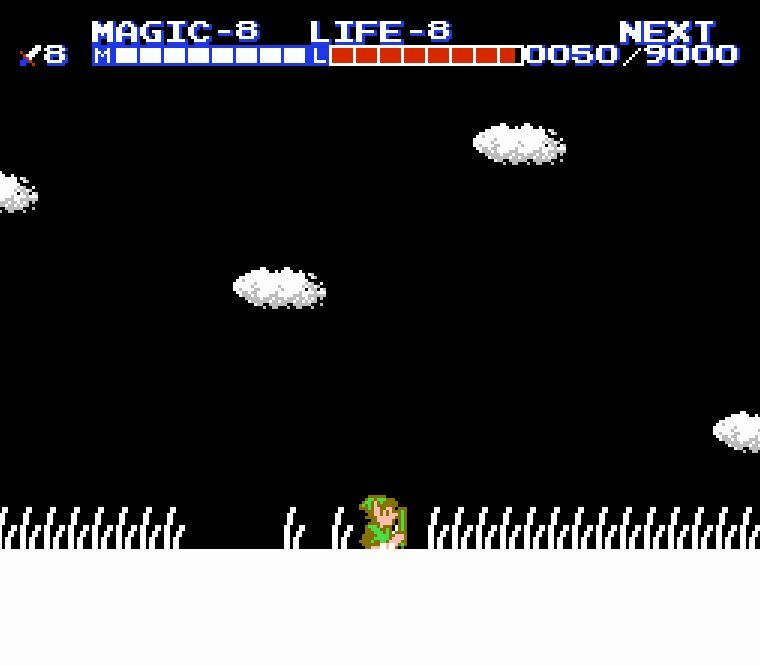 As for changing the color to a darker green I've thought about it some more it might be bad as he could mess in with the overworld forrest areas. I would forsure go with traditional looking hearts. I definitely want to add it I have to ask how it was done. I'll need some help there. Here are two screen shots of forrest area changed I will test raising them as well. I tried to add the insert image with spoliers but its didnt work. The earlier you add the cape, the more opportunities you'll have to improve it. You'll discover new things as you go along. Adding a cape to the world map sprite would be challenging indeed. Maybe do some variations for it, and show us the results. The darker green looks nice on the world map, but maybe try to darken his outline, as well. The forest looks a bit better! The reason I suggested raising the tree line is so you have enough map objects to layer all 3 sections of the battle scene. It just takes a bit of tinkering, and you'll be able to come up with a design the works for the whole scene and not just the center of the scene. Just a helpful tip. Zelda II can be limited in this regard, so you just have to get creative. For the hearts, here is a link to a post explaining how to get traditional hearts. They function like hearts, too. You'll just need a tile editor and hex editor. I designed it for ShadowOne's HUD, but it can be changed to fit with the HUD you have planned. What's your plan for the HUD layout? Just so you know, pretty much any HUD layout is possible. Didn't load. Over at imgur, you can select various links for sharing images. You can either copy/paste the direct link, and then type the BBCode yourself, or imgur provides a link with the BBCode already set. The various buttons in RHDN message panel will insert the BBCode for you. If you do it this way, you'll want to copy/paste the direct link from imgur. thanks its working now BBcode thing is what I did wrong I just copied the straight link to the image. rather then double posting I'll just post another image here. Nice! Looks much better. Try experimenting more with the tree line at that height, or possibly higher. If you use less objects for positioning the tree line, it'd give you more freedom to add layers, as well. That's good progress, though! I like the concept of a having a totally different weather context in the game. A few comments on your "to do" list. - New map layouts are always a big plus for me, so new palaces and new caves equals thumbs up. The tile layout system is a bit clunky with editors because of the way the "writing head" moves, relative to the last object placed. This is of course a tradeoff to save space, but banks 1 and 2, which are the two Overworld banks, have plenty of unused space to play with. Bank 1 has a total of 0x186D free bytes, 6253 decimal, which represents 38% of the bank total space. Bank 2 has 0x17EF unused bytes, 6127 decimal, which is 37% of the total. So, go crazy with the maps details. Creating new tile objects is possible, although you need to program them by hand. The actual limitation is more about the number of areas available. There is a maximum of 63 per region. However, you can use the same area data for more than one place. The original game has this in several places. For example, the cave that you go through to get to the first palace is used many times. The terrain data is the same, but each individual place takes a slot in the 63 available. Areas can be 1 to 4 screens wide, and you can use multiple screens of the same area for different smalls places. Also, you have to reserve 14 areas for random battles. There are 7 possible terrains where you can hit a Demon: desert, grass, forest, swamp, graveyard, road and lava. Each type has weak and strong variations. If you forfeit any of these types of terrain battles, you win back as many areas for something else. You also have to consider Towns and Palaces, which all take slots in the list. - Having small variations on bosses would be very interesting. I can help with ASM, as I did quite a few things with regular enemies. Sometimes, it's just a few variables tweaks to make an enemy easier or harder, or less predictable. With simple ASM, we can randomize some behaviors. You can change projectile types with a few bytes. - The new map idea is ambitious, but having 5 will certainly require ROM expansion. Not impossible, but it's quite an undertaking, as you need to consider many types of data, and most importantly, saving the data to Cartridge RAM. The game has a few quirks about how regions are loaded relative to what spot in the map you walk on. The original game has room and code for 4 distinct Overworlds, but 2 of them, Death Mountain and Maze Island, are perfect copies of one another. Both contain the Overworld tiles of both, Maze Island being to the far right of Death Mountain. Changing one doesn't change the other, however, some internal data is shared between the two, including the saved bytes that keep track of item taken, among other things. - Modifying spells is also straightforward. You can change their effects, their names and the order they appear in the Pause Pane. - Changing the starting stats, like Heart/Magic Containers, is very easy. - Enemy HP is also easy to change, there are tables just for that. What makes it a bit limited is the graphics tiles for the visual EXP points digits that float after killing an enemy. One suggestion I have to make the game "feel" longer would be to have palaces with no crystals, or possibly no bosses. They could be smaller than others, but still contain an interesting item, including Heart/Magic Containers. The game engine certainly permits that. You've done some pretty interested things with enemy AI, so this would be cool to see what happens with this. It would add that bit of uniqueness to help the experience feel new, making things really exciting! About your last suggestion, do you mean something like shrines for Breath of the Wild? If so, would this be in addition to the normal dungeons? Or do you mean to split up existing dungeons into smaller mini dungeons? Either way, interesting suggestion. Something like this would be quite curious for sure. The idea of breaking palaces up into smaller palaces is a fantastic idea. So good that I feel you could make a whole new hack just from this one idea. If you could have multipal small "shrines". Even two room "shrines" the overworld would become so populated but in a good way. You could even have some be more of an open concept. get a key in this "shrine" to open another. Backtracking wouldn't feel like a chore as well. Right now Helmethead is the only boss I haven't made different in some way or another. Either by changing the room to make the boss fell different or changing the AI. only be immune to fire. I'm not sure I like this idea though. its at a place in my game were I don't want the flow to stop because you don't have something to beat a boss. Also in thoery one need only stand in one spot and shot to kill him which is boring. I tested this on barba the fight wasn't good at all and was way to and easy. The other idea is making his fire/lazer balls shot faster or maybe his heads pop off lower so you can't use jump attacks as easily or a combination of the two. for the extra map I've tried to plan for it as much as possible in how it would effect certain things in the other worlds. Mainly items, keys and doors. The idea I have for adding another map is also more simplistic. I plan to have 2 "open" palaces that don't require any keys and have no doors. I have also left a few items availble for this new map the main one being a required magic container to progress further in the game once you beat the new map. Wow, that Helmethead boss sounds brutal! I love it. That was always one of the more challenging boss fights to me since avoiding all of the projectiles can be tricky. Your idea for the 2 palaces is very interesting. Non-linear gameplay is a good thing. If a hack were to be done using Trax's idea of many smaller palaces, something like this would work very nicely with that. Also, that snow encounter is SO amazing! It's so simple, yet so brilliant. I look forward to seeing more of this frozen world you create. If you are curious about adding any ASM modifications, just let me know, and I'll see what I can do. I'm still looking into that snow thing.